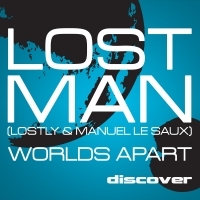 One of the most talked about and exciting colaborations in trance is the alliance between the head of Extrema - Manuel le Saux, and the head of Discover Records - Andre Frauenstein AKA Lostly. With clubland clamouring for the live debut and ASOT and FSOE plays occuring on both releases within days of receiving a copy, you can be certain that this release more than lives up to expectations. No remix required - the original says it all. 'Worlds Apart' is available now from Beatport and iTunes.